Geek Lit Etc. : If the human body is inefficient and messy, why not replace parts? If the human body is inefficient and messy, why not replace parts? Engineers tend to be a funny breed. Oftentimes identifying with their science better than the other humans they work with, they see the world from a much more analytical and logical viewpoint than people whose focus is on the arts, or even the 'softer' sciences. 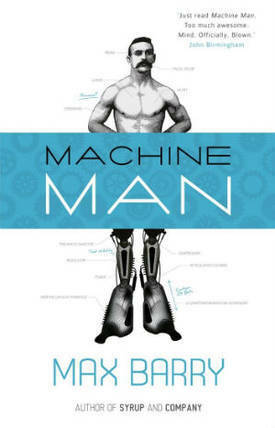 Therefore, the premise of Max Barry's Machine Man makes a certain twisted sense. An engineer like Dr. Charles Neumann is exactly the type of person to be fixated on misplacing his cell phone to the exclusion of everything else. Including putting on pants before going outside to check his car (although one would think he would have a tracker app on it...). It's this single-minded intensity that leads him through his lab and into the Clamp. It's also this tunnel vision that lands him in the hospital, sans one leg. The prosthetic legs that the Lola Shanks brings to fit him with vary. The cheapest, little more than a bucket on a stick, is an insult. There are more aesthetically pleasing options, but Charles has never been one for trading function for form. But that last one, the Exegesis Archion with the microprocessor in the knee...that's something he can work with. Because engineers fiddle. They simply can't leave well enough alone, especially where technology is concerned. So it's not long before Charles has completely taken apart his new leg. As always, it takes a little longer to get it back together again, but he ends up making some pretty sound improvements to it. And since he works with other engineers, they're nothing but encouraging regarding his new side project. There's just one problem: his flesh-and-bone leg can't keep up. It's obsolete, so to speak. But that can be taken care of. While the end result of this process may be a bit predictable, the path that the story takes to get there is quite fun. The situation, both with Dr. Neumann and his company as a whole, escalates to a degree that is almost incredulous. And yet, given the characters that Barry has introduced us to, it is in keeping with their personalities perfectly. Throughout the novel, a dark humor peeks out. This is not a book that takes itself too seriously. Many of the characters are fairly one-dimensional caricatures of positions such as 'HR Lady,' 'Over-Enthusiastic Engineer' and 'Superfluous Middle-Manager.' This lack of characterization doesn't detract from the story; rather, using known tropes helps to move along the plot without bogging it down introducing the reader to a whole company of employees. Max Barry has created a hugely funny, dark comedy look at where technological advancements could lead when factors such as an irrational attachment to the physical body is replaced with a seemingly logical desire for efficiency and advancement. Neumann is the logical extension of the classic science-focused, asocial engineer, and people with friends or coworkers like him will be smiling throughout as the recognize some of the traits. Highs: The contrast between Dr. Neumann's response to the addition of the 'enhancements' and another characters' response really shows how far off the deep end Charles gets. Lows: It's almost a certainty that some people will be upset at what they see as a mockery of the less socially-apt 'geek' character, but to me it seems like it's all in good-natured fun. Verdict: This is hardly great literature, or an in-depth examination of the use of technology to enhance the human form, but it's not trying to be.